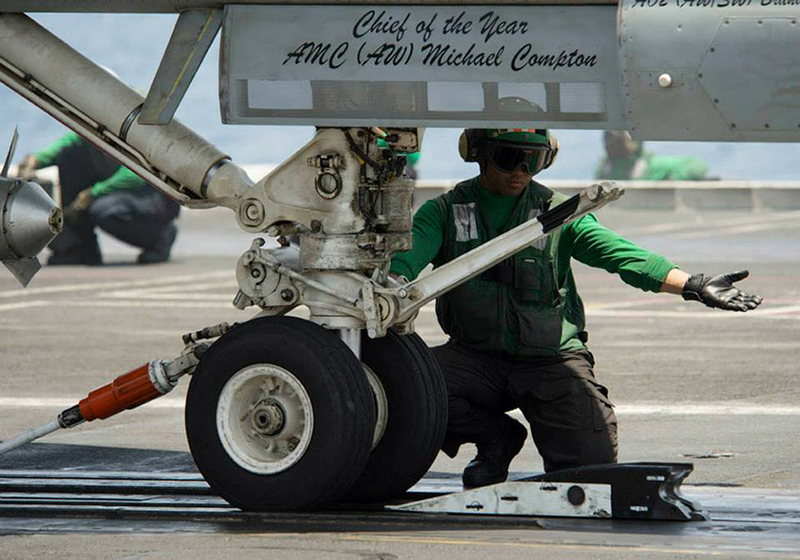 California State University, Northridge alum Petty Officer 2nd Class Mark Dalmacio recently served as a Catapult Captain aboard the USS Dwight D. Eisenhower, where his job was to launch jets for ground-support missions in Afghanistan, Iraq and Syria. U.S. Navy photo submitted by Mark Dalmacio. Petty Officer 2nd Class Mark Dalmacio working on the flight deck of the USS Dwight D. Eisenhower. U.S. Navy photo submitted by Mark Dalmacio. Petty Officer 2nd Class Mark Dalmacio conducts a no-load test of catapult No. 2. US Navy photo submitted by Mark Dalmacio. CSUN alum Mark Dalmacio's frocking ceremony as the petty officer advanced in rank from Third Class to Second Class. U.S. Navy photo submitted by Mark Dalmacio. 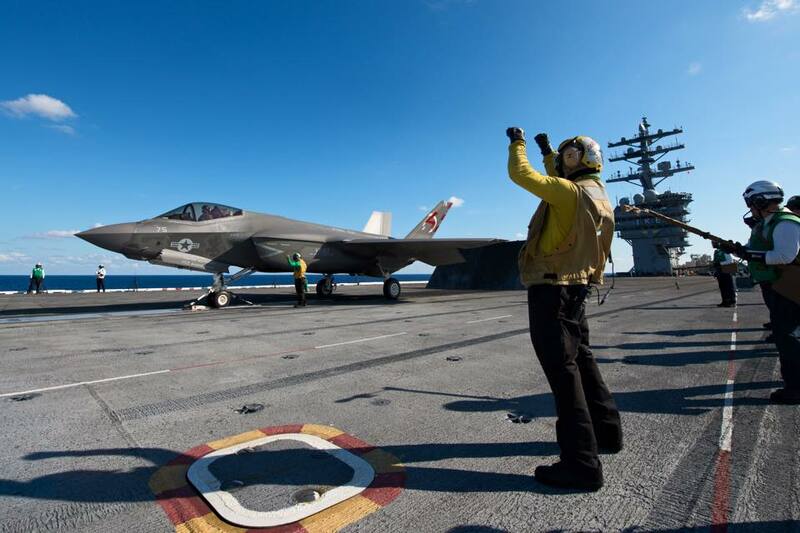 CSUN alum Mark Dalmacio (green shirt, yellow vest) supervises the launch of the F-35, the military's newest joint strike fighter jet, aboard the USS Dwight D. Eisenhower. U.S. Navy photo submitted by Mark Dalmacio. 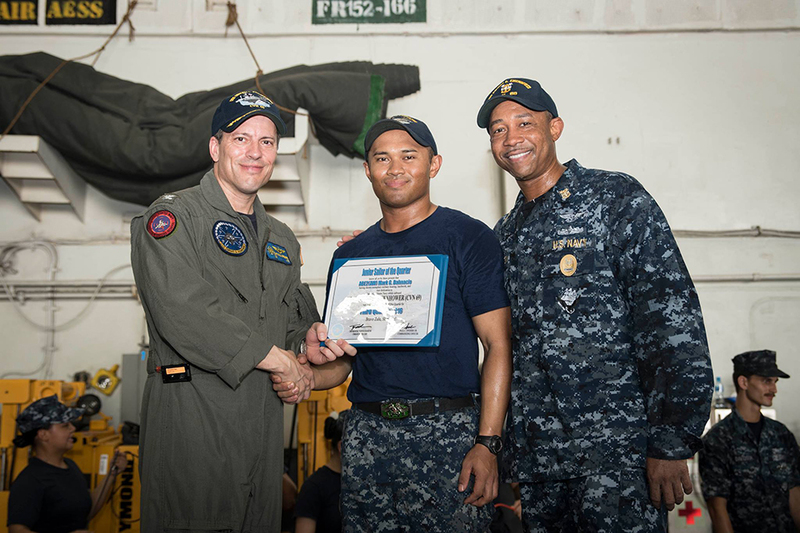 CSUN Mark Dalmacio was honored as "Sailor of the Quarter" for the third quarter in 2016 for the USS Dwight D. Eisenhower. U.S. Navy photo submitted by Mark Dalmacio. 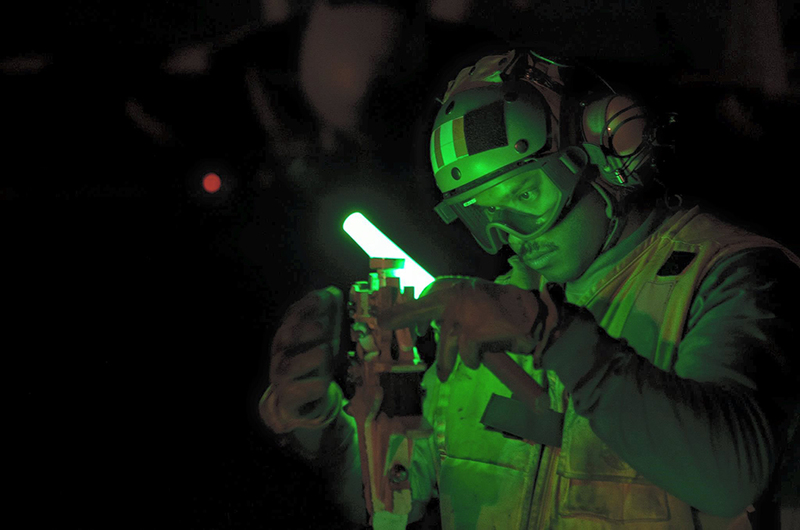 Petty Officer 2nd Class Mark Dalmacio uses a green wand to inspect an aircraft holdback fitting before a nighttime launch aboard the USS Dwight D. Eisenhower. U.S. Navy photo submitted by Mark Dalmacio. Petty Officer 2nd Class Mark Dalmacio, a CSUN alum, on the flight deck catwalk aboard the USS Dwight D. Eisenhower. U.S. Navy photo submitted by Mark Dalmacio. Petty Officer 2nd Class Mark Dalmacio, a CSUN alum, on the flight deck of the USS Dwight D. Eisenhower. US Navy photo submitted by Mark Dalmacio. 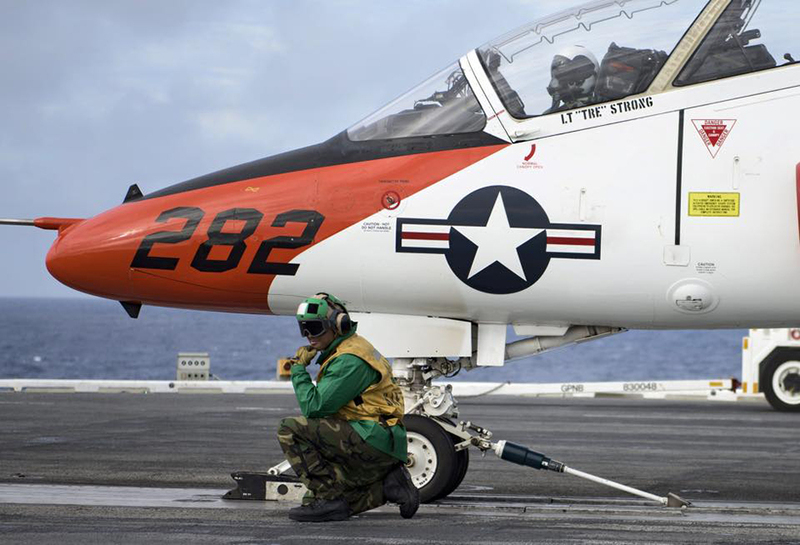 Petty Officer 2nd Class Mark Dalmacio has spent much of the past five years on an aircraft carrier at sea, catapulting fighter jets into the sky. 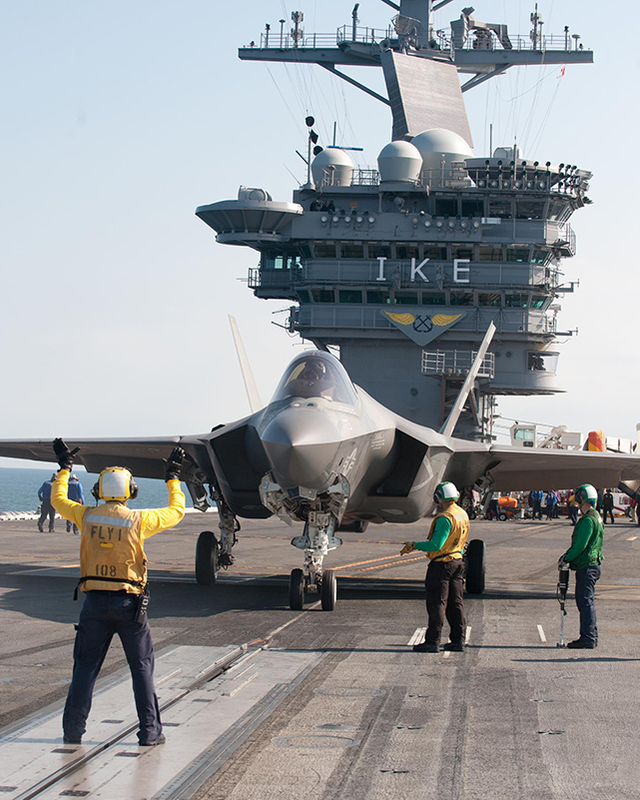 Until the United States Navy’s USS Dwight D. Eisenhower returned to port this summer for maintenance and upgrades, Dalmacio ’11 (Screenwriting) served as a catapult captain — the guy who pushes the “fire” button, the last move in a complex series of steps required to give jets enough momentum to lift off from short carrier runways. As an enlisted man with the rating of Aviation Boatswain’s Mate – Equipment, Dalmacio helped launch approximately 100 jets per day for thousands of ground-support missions to Afghanistan, Iraq and Syria. This occupation was a bit of a plot twist for Dalmacio, who attended California State University, Northridge with dreams of writing movies and TV shows. But CSUN, he said, gave him the tools to succeed in the military, preparing him for a leadership role in one of the most high-pressure jobs on the planet. Dalmacio grew up in South Lake Tahoe, Calif., the son of a Philippines army veteran who emigrated to the U.S. in the early 1980s (before Dalmacio, 29, was born). Mark Dalmacio completed his bachelor’s degree and enjoyed himself at CSUN — even serving as vice president of recruitment for the Sigma Phi Epsilon fraternity — but he opted to find a more stable income than an entry-level job in the entertainment industry. Like all aircraft carriers, the Ike is a floating air base, a massive piece of military equipment that can be deployed offshore where “something crazy is happening,” as Dalmacio put it. The nuclear-powered ship is 24 stories tall, nearly 1,100 feet long, and its flight deck is 252 feet wide, according to the Navy website. Despite its size, the Ike’s runways are about 300 feet long, nowhere near the more than 2,000 feet of runway that jet fighters typically need to get airborne. To compensate, aircraft carriers use catapults. That’s where Dalmacio came in. 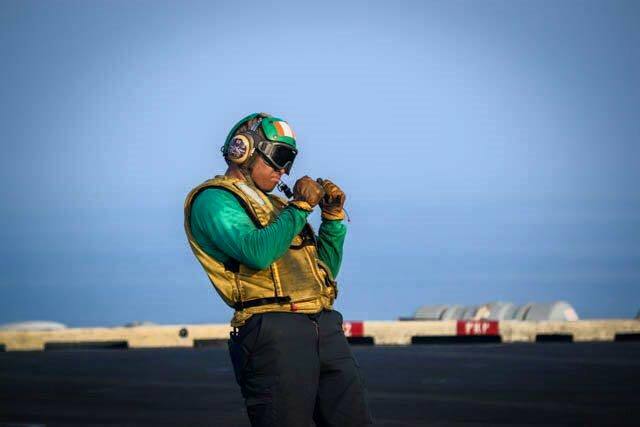 He worked his way up to catapult supervisor during four deployments (including one as a volunteer aboard the USS George H.W. Bush), each lasting six months or more in the Mediterranean Sea, Indian Ocean and the Persian Gulf. The “birds” he helped launch included F/A-18 Super Hornet fighter jets, E-2 Hawkeye surveillance jets, EA-18G Growler electronic attack jets and C-2 Greyhound cargo jets, Dalmacio said. He started as a crewman on the flight deck, doing a lot of the grunt work such as installing fittings on aircraft. Dalmacio compared an aircraft catapult to a double-barreled shotgun, with the jet riding on top of the barrels. The catapult is powered by steam, generated by nuclear reactor-heated ocean water. When Dalmacio pushed the “fire” button, two doors opened that released the steam and propelled the two barrels down the track. Dalmacio and his team monitored steam pressure and braking systems, raised the jet blast deflectors and made sure every critical component worked properly. For example, if the doors holding the steam open too slowly, the jet won’t get off the deck with enough speed and will launch itself into the sea. His team performed maintenance on the barrels that transport the plane down the deck, and the launch shock absorbers that handle 0 to 160 mph in less than three seconds. “There’s a ton, a ton, of maintenance,” Dalmacio said. The young sailor’s time at CSUN prepared him for a leadership role, he said. Recruiting for his fraternity taught him how to appeal to each individual’s motivating forces, Dalmacio said. CSUN’s diverse campus also taught him how to relate to a military population more diverse than the U.S. as a whole. The “fire” button for the carrier’s catapults is located on the far edge of the flight deck, alongside the runway. At that station, Dalmacio had his back to the water. Before launch, he had to confirm that air, hydraulic and steam pressures were good, that mechanics gave the thumbs up for flight, and that the flight deck was clear. The first time he pushed the button, Dalmacio said, he took a deep breath, exhaled, and sent a 55,000-pound jet loaded with ordnance on its way. The Matador faced other, more physical and physiological challenges at sea. For up to 50 days at a time, he could see nothing on the horizon but ocean. Onboard ship, there are no days of the week, just work days stretching 12 to 18 hours, sometimes more. On the flight deck in the Persian Gulf in July, the temperature sometimes exceeded 120 degrees. Dalmacio couldn’t eat much, because he had to squeeze meals between launch cycles. When he could get away, the lines on the “mess deck” were always long, so he often just made himself a quick sandwich. But the Ike docked in places such as Spain, Greece, France, Portugal, Bahrain and Dubai, and Dalmacio had a few days of shore leave to look around. And the job itself was awesome, he said. 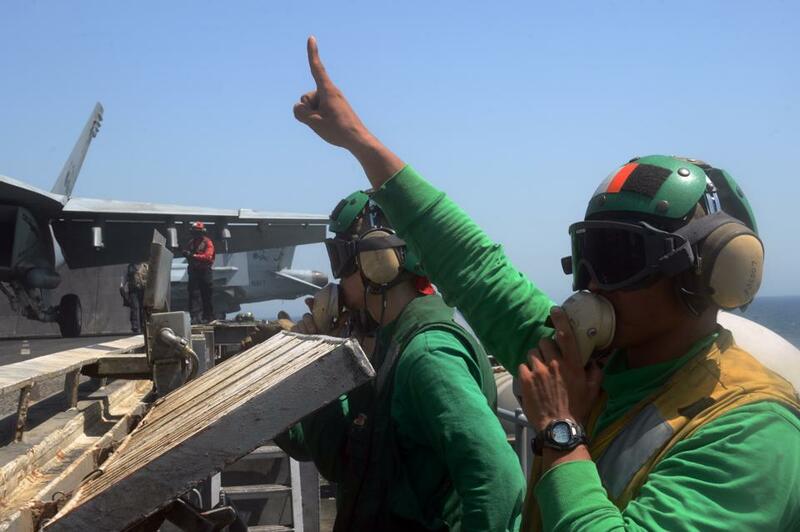 “To be a third person watching flight operations on the flight deck, it’s like a dance,” he said. “You see all these people working robotically. ‘Birds’ up, this happens, this happens, this happens, this happens, boom. All right, repeat. Catapult 1, catapult 2. One and 3 are launching at the same time. Two and 4 are launching at the same time. Boom, boom, boom. Dalmacio’s last assignment on the Eisenhower was readiness training, spending two or three weeks at a time practicing for combat missions in case a sudden need for deployment arose. 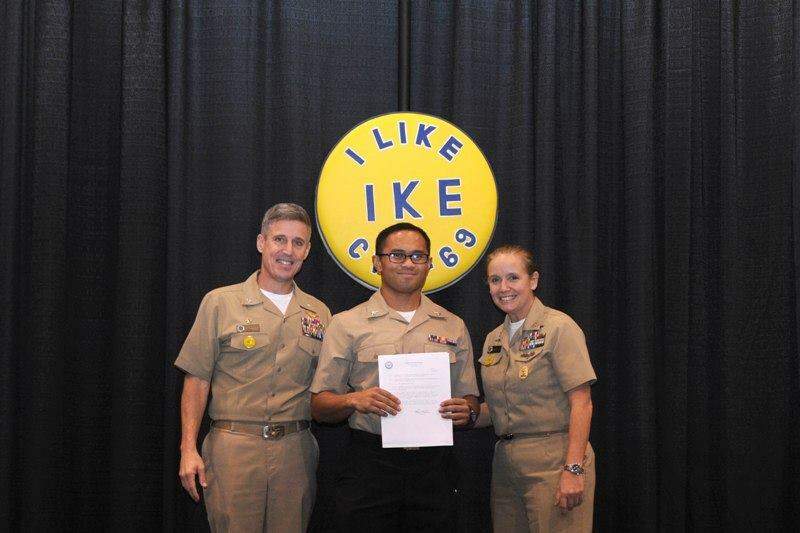 This summer, Dalmacio began a three-year assignment as a barracks supervisor at Naval Base Kitsap in Bremerton, Wash. If Dalmacio decides to re-enlist at the end of the assignment, he said, he’ll likely go back to sea. He’s not screenwriting now, but his time in CSUN’s program definitely shaped his life, he said.